Once you have determined the load characteristics of your raised deck and the number of deck support columns required you can determine the design and size of the deck support columns. Although all support columns do not have to be the same size, from an aesthetic view using the same size support columns throughout your deck design will augment the appearance of the deck. Figure 1 shows a deck using different size and material for the deck support columns. 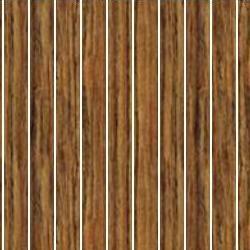 The change in size and material has a negative effect on the appearance of the deck. 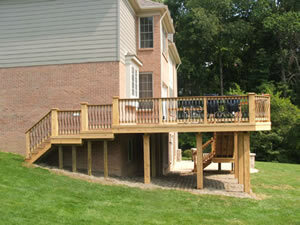 You have a number of options when it comes to constructing the support columns for your deck. Some are related to the area that you live in. In climates that experience frost in the winter months, the footings must be a minimum of 1 foot below the frost line. Your municipal building department can advise you on the depth of the frost line in your area. 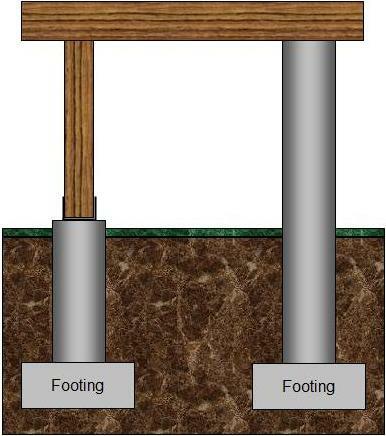 You can build the deck support columns using a poured footing with a concrete tube to just above ground level and use a wood post to continue to deck beam level or you can take the concrete tubes to the height of the deck beams as shown in Figure 2. Although I don’t recommend it you can pour a concrete footing and concrete in a wood post from the top of the footing to the bottom of the deck beam, in a similar manner to adding concrete to a fence post to give it stability. In areas that are not subject to frost, a concrete footing should still be poured at least 1 foot below grade and on clay soil. Do not install a footing on organic soil as the footing will eventually sink and/or shift. The species of the lumber. The load the deck support column must carry. The height of the deck support column. Table 1 compares the 5 most common lumber species with respect to load, height and dimension. Your local lumber yard should be able to provide you with similar information on species that are not listed on Table 1, but are available in your area.